The concept of a 'Pocket Microscope' contained in a small case, small enough for the pocket, dates back hundreds of years. Some of these were quite complex, and others quite simple. Some examples were integrated into the case and easily erected or taken down as needed. Some of these were simple microscopes, some compound, including some compound microscopes from before the achromatic era. One could even argue that, because of their small size, Antony Van Leeuwenhoek's microscopes would qualify for this category, though he never sold them and never used anything bigger. 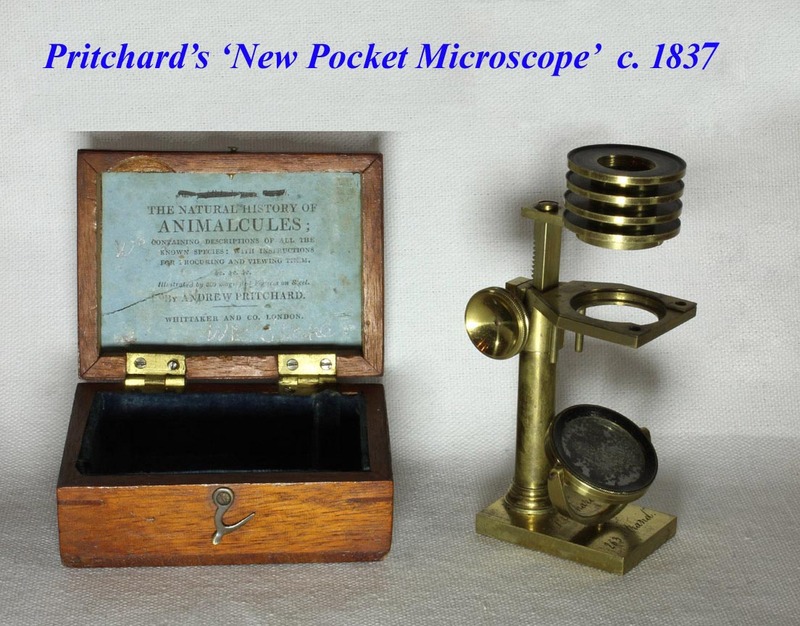 Obviously, miniature microscopes, like John Browning's example, would also qualify as pocket instruments, and even his 'New Pocket Microscope' of the late 19th Century, though the latter was much larger than the miniature example. One should also note that the size of the case for what was called a 'Pocket' microscope, varied from truly pocket size, e.g. 3 X 2 X 1 inch, to quite a bit larger (not fitting in any of my pockets!). As time went on what constituted a pocket microscope changed. 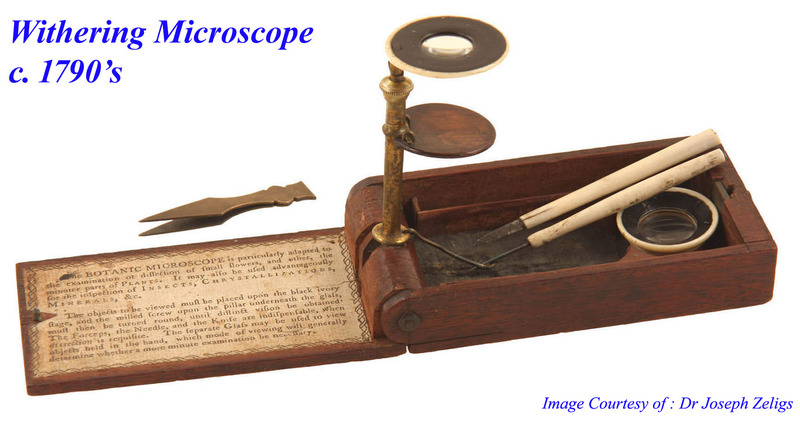 The German term 'Taschenmikroscope' (translation=pocket microscope),was often used to describe not only compact traditional instruments, but also some simple (single type) microscopes. 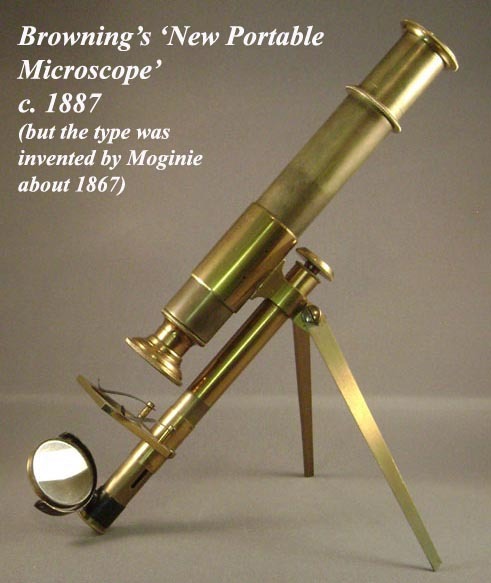 Even the simplest small cylinder microscopes were referred to as 'Taschenmicroskopes' and this term was included in their title. In the 1920's and 1930's fairly sophisticated very small portable microscopes were developed though of varying quality and ease of use. Likely the best was the newly invented inverted microscope of John McArthur in the 1930's, many examples cited in a review of this site. Variations of the McArthur continue to be made today. The other pocket or portable microscopes of the 1920's and 1930's, such as the Tami, Potami, Leitz Minor, Bausch & Lomb #40 Portable, are, or will be, well documented on this website. 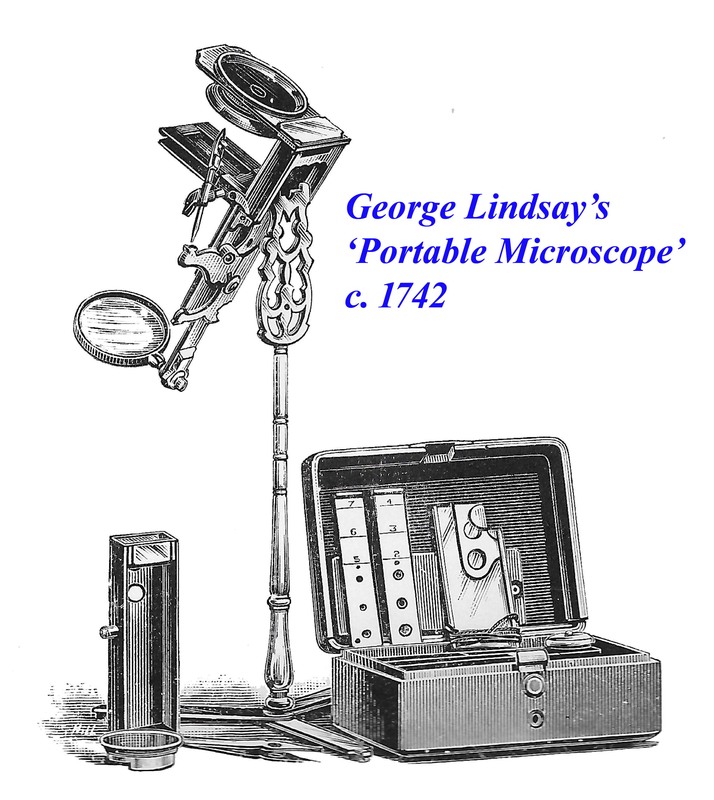 The Lindsay 'Generally Portable Microscope' is a simple microscope that was patented in 1742. This is the first English patent for a microscope. This instrument when disassembled fit in a small box measuring only 3 x 2 1/4 inches. The Watkins Microscope is a compound microscope that was made of silver and when disassembled, fit in a box twice as big as the Lindsay, measuring 6 3/4 x 5 3/4 x 2 inches. It has the distinction of being one of the earliest microscopes to have an inclination joint for the limb, though at a very awkward location making it quite unbalanced. 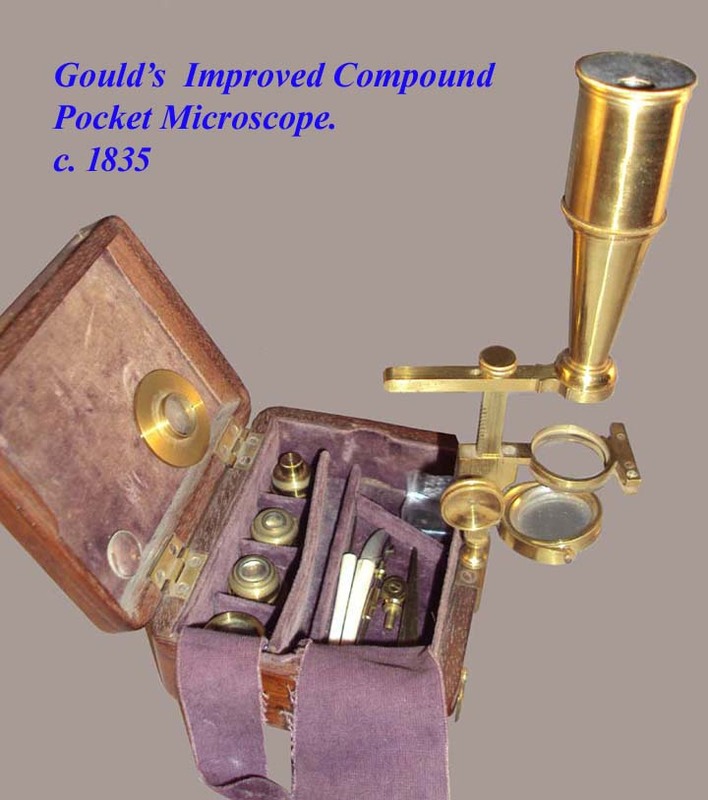 Adams 'Compendious Pocket Microscope' was an early example of a microscope specifically said to be designed to be highly portable and carried in a relatively small case. Nevertheless, even in its case, it could hardly be considered 'pocket sized.' 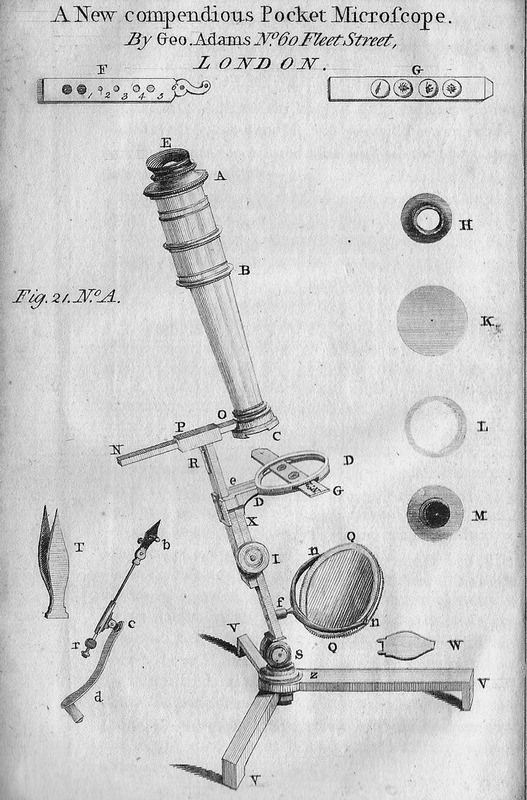 The image to the left is from the 1771 fourth edition of Micrographia Illustrata by George Adams Sr.
One of the earliest types of microscope to be included in the class of 'pocket microscopes,' and yet be considered common, was the smaller version of the Screwbarrel type. Handheld, and contained in a small case, these instruments were ready to use right out of their case at a moments notice. 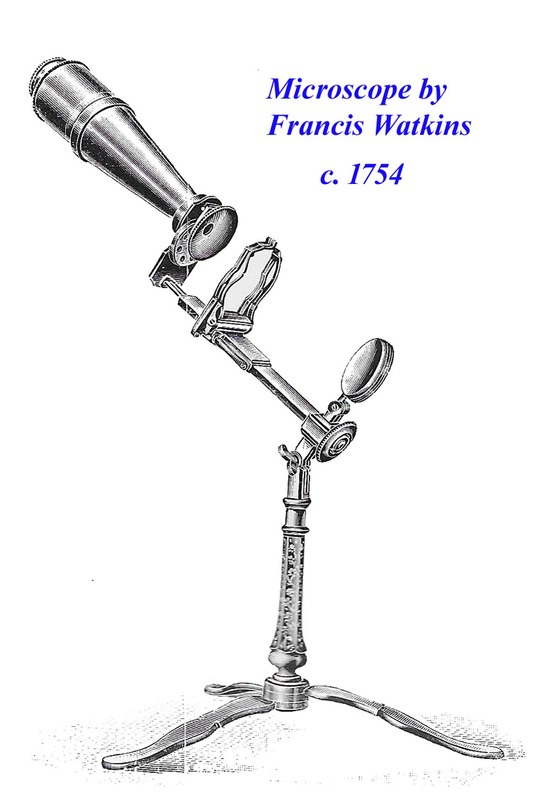 Perhaps the simplest example of the self-erecting type of pocket microscope is the Folding Withering Botanical microscope (left) circa 1795. This simple device erected itself upon opening the case. Withering himself stated that he invented these to be more easily carried in the pocket compared to his bulkier, but still portable, cylindrical forms. The W. & S. Jones 'Improved Botanical' or 'Universal Pocket' microscope fits in a very small case but requires a few steps for assembly. For an extra charge, it also came with a Hevelius screw fine focusing mechanism. The case of this instrument measures a mere 3 3/16 x 3 15/16 x 1 7/16 inches in thickness. In contrast to the automatically erecting model by Withering shown above, which becomes ready for use automatically as the lid of the case is opened, the Gould Pocket Microscope shown here, like those of Lindsay, and W & S Jones,, while fitting in a small case, required some effort for assembly and disassembly. Some pocket microscopes, in addition to the screwbarrel type, were almost ready to use right out of the case. 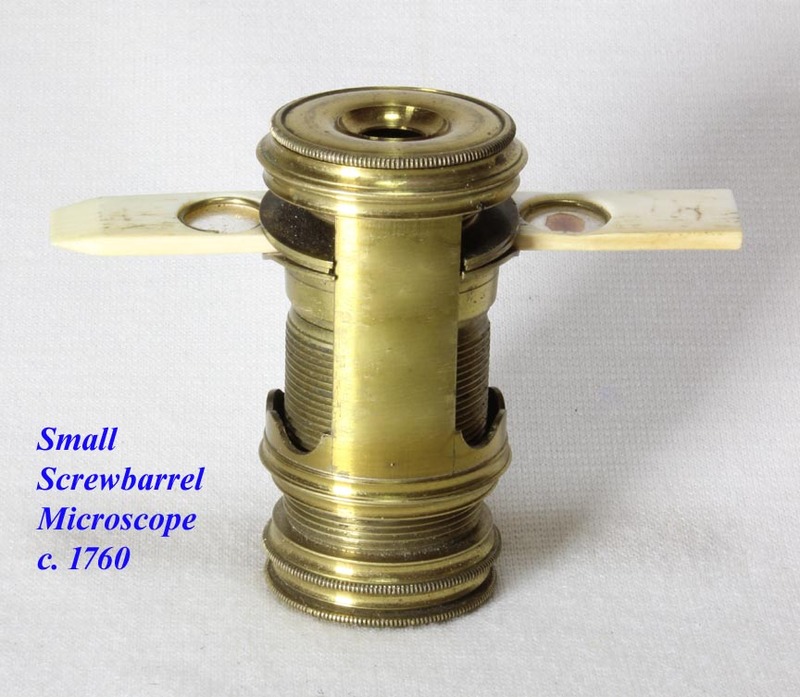 An example of this type would be Andrew Pritchard's 'New Pocket Microscope' of about 1837. 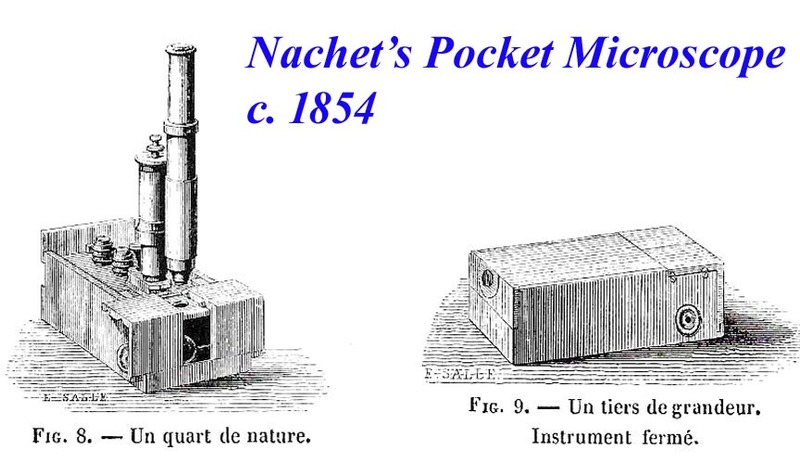 One of the best and earliest examples of an achromatic Pocket microscope, is the 'Microscope de Poche' by Nachet, first offered in the Nachet catalogs of the 1850's through at least the 1870's. Nachet's 'Microscope de poche' simply required flipping the lid upside down, pushing the body of the instrument into a dovetail, and spreading the two wings over the stage to be ready for use; the mirror was already in place. 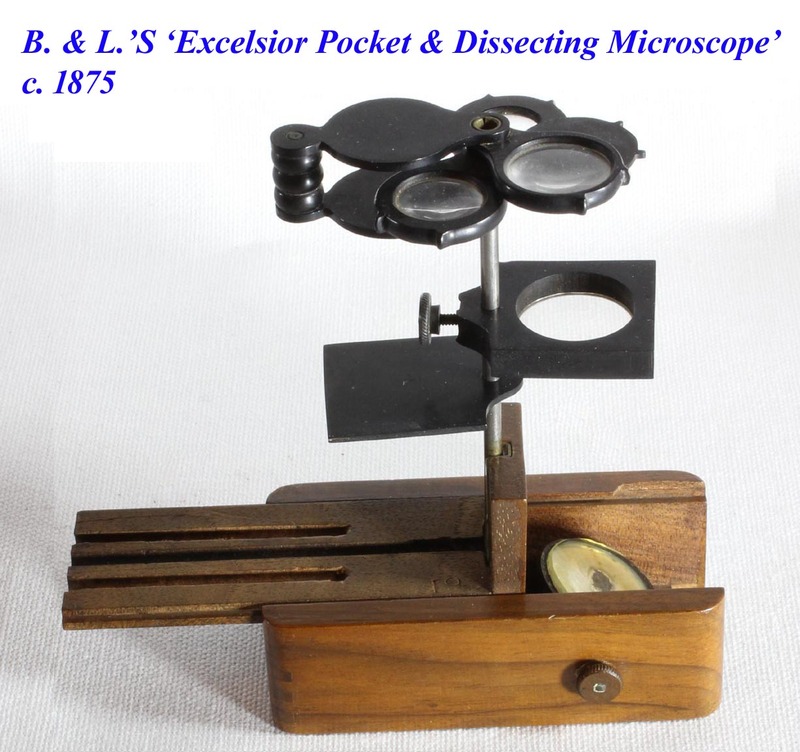 The similarity of the wooden 'Excelsior Pocket and Dissecting Microscope' of Bausch & Lomb to the earlier Nachet is unmistakeable. Here B & L simplified the design with cheaper materials and the use of simple lenses. This microscope requires more effort to erect from its parts than the Nachet however. The parts are also much more delicate, and easily broken if the microscope is not assembled carefully. 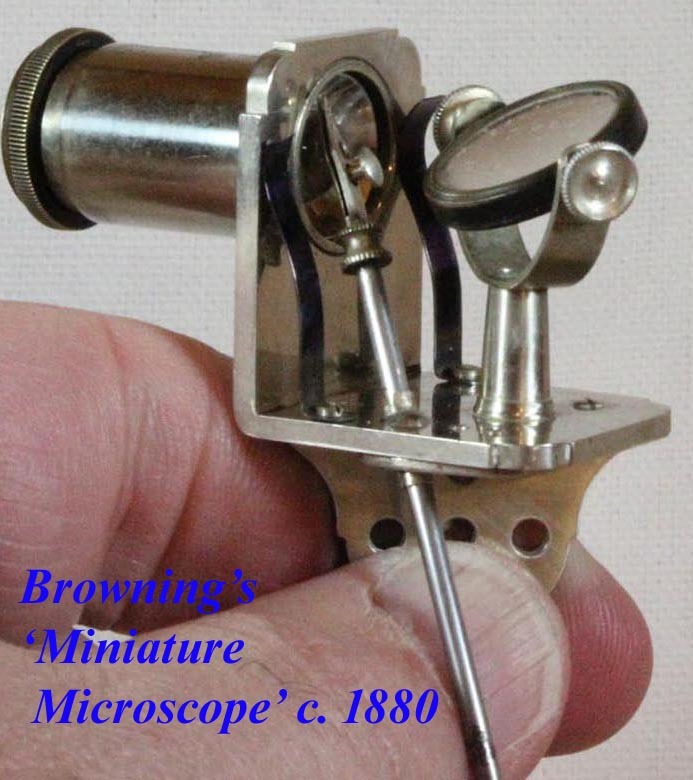 The 'Browning Miniature Microscope' was ready to use right out of the case, though not easily, as it is so small, someone with average to large hands will find it difficult to use! 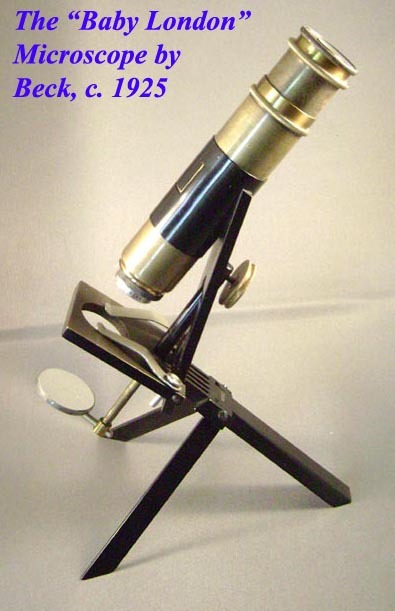 The folding portable microscope sold both by J.H. 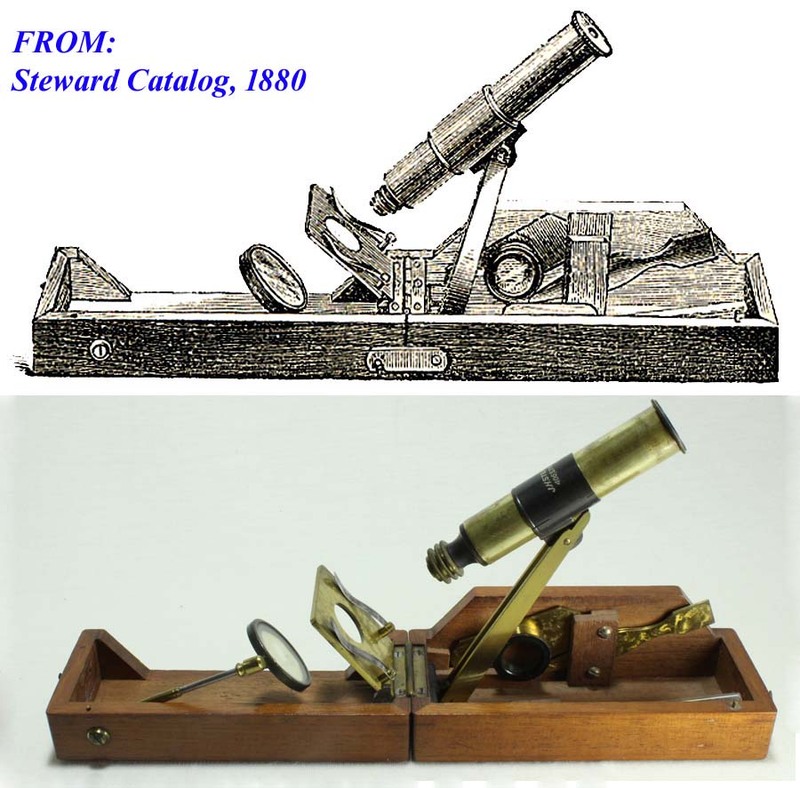 Steward and also by Newton, from about 1880, through the early 20th century, is a compound example of a portable microscope permanently attached to the inside of its case, similar to the Withering Folding Model. Differences of course are the fact that this is a compound instrument, and it is not self-erecting. It is easily and quickly set up though. The Browning 'New Portable Microscope' is a design quite similar to many others and is based on the Moginie type first sold by Charles Baker starting about 1867. Another similar design is that of Blankley's Seaside Microscope made by James Swift as seen on Allan Wissner's site. All of these form a tripod with the tube integrated into one of the three legs. This is a much more practical, though much larger instrument than Browning's Miniature Microscope. The 'Baby London' Microscope, by R. & J. Beck, was one of many more sophisticated folding tripod microscopes circa 1925. The Bausch & Lomb Portable is very similar (though not as well made). 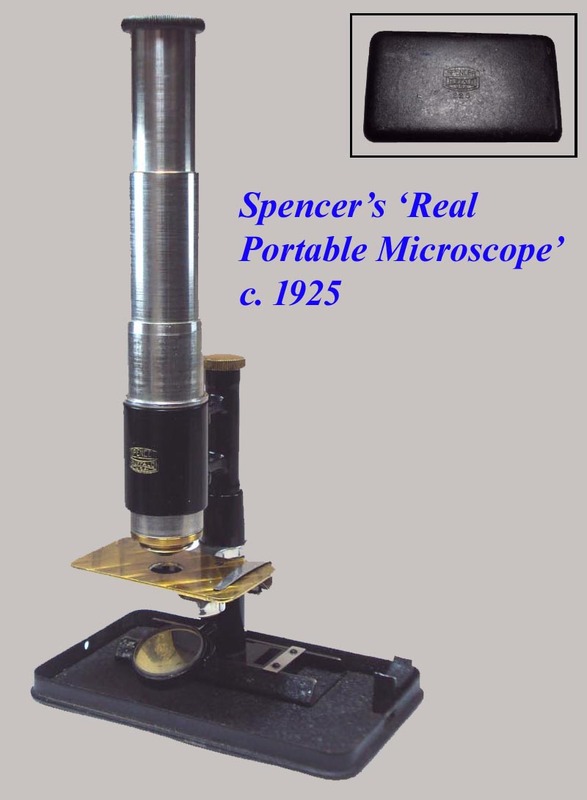 The Spencer 'Real Portable Microscope' or 'No. 75', fits into a case not much larger than Gould's, but requires even more steps for assembly to make ready for use. Unlike Gould's but similar to the Folding Portable sold by Steward and also by Newton, it is permanently attached to the inside of its case. The No. 75 is from about 1925 and its case of made of metal. It features a telescoping tube permitting variation in tube length from 65 to a full 160 mm. 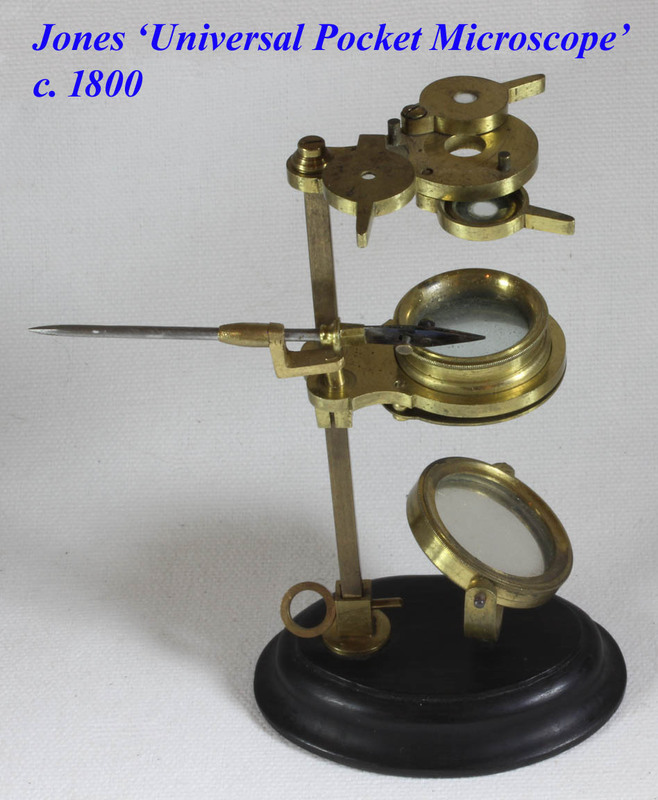 Many variations of the pocket microscope were made by the French and others in the late 19th century, and variations continue to be made today. Plastic examples of pocket microscopes are still being made in large numbers today.